Start In McKinney Estates off Highway 89 about 8 miles south of Tahoe City. From Ski Bowl Way, which is at the southern boundary of Homewood, drive 1.2 miles south on Highway 89 to McKinney Rubicon Springs Road. Turn west (right) onto McKinney Rubicon Springs Road and drive 0.3 miles to where you turn left onto Bellevue Avenue. Continue for 0.2 mile to where you turn right onto McKinney Road (Springs Court) and in another 0.3 mile turn left onto McKinney Rubicon Springs Road once again. In 0.1 mile you intersect Evergreen Way. This intersection is where the tour begins. Part of the beauty of this tour is that you pass by three lakes, McKinney, Lily and Miller, along the way to Miller Meadows. Any one of the lakes makes a good destination. This pleasant tour through a very scenic area was once popular with day skiers, but the difficulty in parking has now relegated the tour mainly to those heading into Ludlow Hut for an overnight tour. They appear to be the only people who are willing to expend the energy to deal with the parking situation. You have three choices for dealing with the parking. Shovel out a parking area behind the snow stakes. Pay a resident to allow you to park in their driveway. Have a friend who is willing to drop you off and pick you up. 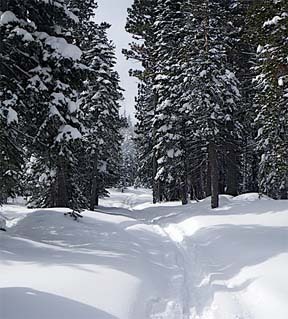 Once on the trail, the navigation to Miller Meadows, or any of the three lakes along the route, is easy. However, extending the tour the additional mile to Ludlow Hut makes the navigation considerably more difficult. Ski on the snow-covered continuation of McKinney Rubicon Springs Road to the southwest for 1.5 miles until you reach the bridge across McKinney Creek (2). Cross McKinney Creek and ski west on the road for 0.8 mile until you reach a location above and to the north of McKinney Lake (3). Continue skiing generally west on the road for 1.0 mile until you reach Lily Lake (4). Ski slightly south of west on the road for 0.6 mile until you reach Miller Lake (5). In the past, the cabin marked on the topo at the north edge of Miller Lake made a nice shelter for lunch during cold, windy weather; regretfully it no longer exists. Ski slightly south of west on the road for 0.3 mile until you reach Miller Meadows (6). 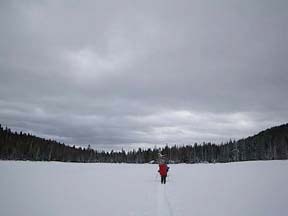 The section from Lily Lake to Miller Meadows is flat, and you can ski across Lily and Miller lakes if they are well-frozen.